For the second year in a row, the Washington Redskins’ season has become defined by injuries. Three starters will undergo season-ending surgeries, coach Jay Gruden said Monday, threatening to derail what had been a promising start. Richardson has battled through a shoulder injury since training camp, then later hurt his knee. There had been previous weeks in which he considered shutting it down, but he continued playing until making this decision Monday. Gruden said Washington will sign at least three offensive linemen and one of them might need to start Sunday at Tampa Bay. The only two original starters will be Moses at right tackle and center Chase Roullier. They can start veteran backup tackle Ty Nsekhe in place of Williams and Tony Bergstrom at left guard. They have undrafted rookie free agent Casey Dunn on the roster but are hoping to find someone with experience to possibly start at right guard. The Redskins signed Richardson in the offseason to a five-year deal worth up to $40 million, wanting more speed at receiver. 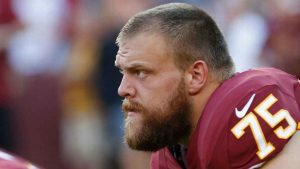 He had suffered a torn ACL in Seattle during a playoff game in 2015, but it was his shoulder that spoiled his first Redskins season. He hurt it early in training camp and eventually the bone started to become visible, almost poking through his skin. Richardson insisted on playing despite the issue, but it required having his shoulder numbed before games.